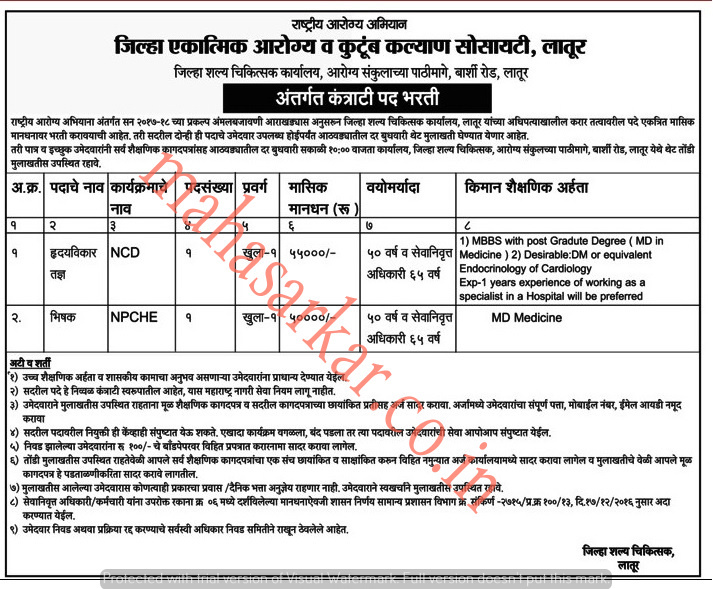 Jilha Ekatmik Arogya & Kutumb Kalyan Society (Rashtriya Arogya Abhiyan),Latur Published Job Notification for 02 Heart Specialist & Bhishak Posts. Candidates who wish to apply must look at Jilha Ekatmik Arogya & Kutumb Kalyan Society Heart Specialist & Bhishak Recruitment 2018. Eligible candidates can join Walk-in Interview on 28-03-2018. Education Qualification: MBBS/Post Graduate/MD and more. For Post wise Education Details follow the detailed advertisement. Starting Date, Last Date to Apply Offline at Rashtriya Arogya Abhiyan which candidates should be remembers as follows.